Wildfowling on a budget: For the second leg of my sporting odyssey, Morston fowler Jim Temple took me wildfowling with the Blakeney & District Wildfowlers Association on the north Norfolk coast. Jim has shot over this particular foreshore for more than 50 years. He explained most wildfowling is organised through a network of clubs, and it was through the association we secured day permits to shoot near Blakeney. Wildfowling permits over Blakeney are restricted for management and conservation purposes, but Jim had procured permits for my brothers-in-law, James and Pete. My father, John, also joined us. We rendezvoused with Jim the night before our morning flight to discuss our plans. This planning is essential for wildfowling because the foreshore is unforgiving; tides, wind and boats – there are so many variables to consider. Jim has an unparalleled knowledge of local bird movements. He knew what tides were due and was able to mitigate the risks inexperienced wildfowlers face. We arrived at the harbour at 5.20am to find Jim already packing his dinghy. After checking the winds, the tides and our equipment, we loaded into Jim’s boat and set off. The sky was clear, however, which enabled Jim to navigate by moonlight. Despite a strong offshore breeze we made good time and we soon landed in the creek that would shelter us during our flight. Jim placed us along the waters edge and gave directions as to where the flight lines would be. Finally, we planned our departure time and point. Flexibility was going to be key. Unlike pigeon shooting, we wouldn’t have a hide to conceal our whereabouts. Instead, we were reliant on established flight lines and our ability to hide within the salt-marsh vegetation. Jim knew most birds would follow the meandering creek, especially as the tidal waters receded. We therefore needed to trail the tide to keep the wildfowl within range. We crouched with our backs to the mainland and faced the offshore breeze. For now, darkness concealed our position, although the same could be said of the birds too at this point. However, the night would not remain and soon our sport would begin. Once in position, I heard the beating of wings and the distinctive whistle of wigeon. The light was still dim as birds began to swing past me, but unfortunately I couldn’t identify the birds quick enough to shoot. Dawn finally began to break and a faint glow appeared in the east. Once more, a wigeon burst over me. This time I recognised the duck, but I was still too slow to get a shot off. I gathered myself in the creek, keeping my gun in the ready position. Suddenly a pair or wigeon crossed left to right in front of me and I swung through in time to drop the trailing bird with my first and only shot. With Jim and the dogs some way off, I waded over to the bird and retrieved it before the sea could do so. Disturbed by my shot, a steady stream of birds began to move along the creek. Some were within our range, but many were outside of it. Some wigeon, plus a few teal, continued to follow the creek while others broke inland looking for shallow pools in which to dabble. The dim light meant I seldom had time for a second shot. Successful coastal wildfowling requires a good knowledge of the tides. Still, this focused my mind and I made a determined point of making every chance count. I managed to bag a couple of wigeon from flushes crossing my position, while missing a few easy birds overhead. Despite this, our bag steadily began to grow. As the sun rose, a variety of bird species began to move, making identification imperative. I picked out the silhouette of a drake pintail overhead, but was too late to shoot. Soon flocks of Brent geese and pairs of shelduck began to fly past, as did assorted curlews. Some fell to our guns, others sailed on untouched. Soon enough the sun filled the sky and it was almost time to pack up. To complete the flight Pete brought down a difficult teal – his first. As our flight drew to a close, I experienced feelings of both exhilaration and emptiness. It was sad to end such a memorable flight. During our flight we had seen a variety of birds and we had attempted a range of shots. Some shots were hard, others harder still. What became obvious, however, was that wildfowling isn’t a sport for the fair-weather shot; this is wing shooting at its best. Clearly, wildfowling is a trial of skill and of endeavour, fought against a wild quarry in its element. Jim was swiftly on the scene and his labs went to work picking two final wigeon that had landed in the pools of water that surrounded me. Jim’s stories of memorable flights from years gone by built my resolve to return to the marshes again. Day permits are available from many wildfowling clubs for around £20 per permit. Some clubs will also require you to be accompanied by an experienced club member. For information on your local wildfowling club contact BASC. Since wildfowling consists mainly of evening or morning flights it is highly likely that you will need local accommodation. Local B&Bs often offer the best rates and may be able to put you up for as little as £20 per person, including a cooked breakfast on your return – most welcome after a morning flight. In areas where club members are not able to host you, you may be able to secure the services of a private wildfowling guide. Such a guide will cost at least £100 per day. During our trip I shot with an over-under 12 bore and used steel cartridges to keep costs down. I shoot 32gram No.5s and try not to attempt any shot outside of 30 yards. Additionally, make sure you have a good torch, preferably head mounted, so you can get about and also find your quarry. I used full-length waders and a strong stick to get around. My shooting jacket was warm and lightweight, and its high cut made moving around easier. My experiences of wildfowling remain limited. That said, I appreciate that shooting on the foreshore is significantly different from flighting duck on a pond. Certainly wildfowling is a degree harder than pond flighting and infinitely more rewarding. Jim taught us the importance of preparation. 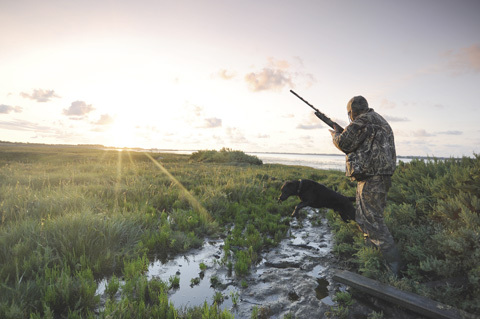 Wildfowling in the inter-tidal zone is potentially dangerous and requires careful planning. You must understand the weather and tide patterns you will face, and you must study the land over which you will shoot. When wildfowling, you must work with the conditions and within your limitations. If you do so, you will enjoy the most amazing shooting experience in a truly exceptional setting. Above all else, plan ahead. It is essential to learn your quarry, shoot safely, and bring the correct equipment. The second leg of the sporting odyssey has taken me to an extreme yet beautiful landscape. We returned with a bag of 11 wigeon and one teal, a fair return for our endeavours. Moreover, with the benefit of strong local knowledge and some calm seas, we were able to experience challenging wildfowling on a budget.